A while ago, I was given the opportunity to build and paint a Sable Sword Terminator Captain. No problem I thought... until I saw what my Client had in mind for some of the conversions. Looking at the sketch he sent me, I knew I was in for some work. A custom head piece and helmet, resculpted forearms to create a different look to the armour, a little bit of freehand combined with some sculpted iconography, all the usual suspects and then some. His sword is actually an Empire sword. It gave the model a subtle but important change in his look. He wasn't holding yet another "power sword." 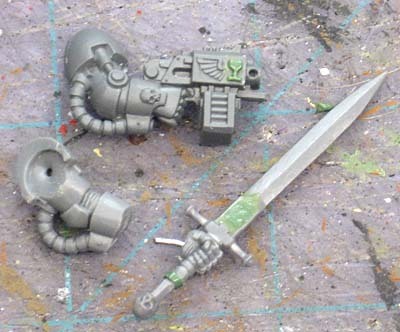 I cleaned the iconography off the Empire sword, extended the handle to give it some weight and added a small icon to the side of his storm bolter. Being the Captain, he's allowed to wear his personal heraldry which happens to be a chalice in this case. And here are both arms with their resculpted forearms. You can see that I repeated the small chalice icon on the sword as well. That actually played an important part when it came time to paint the blade later on. The head piece is made of plasticard and greenstuff. 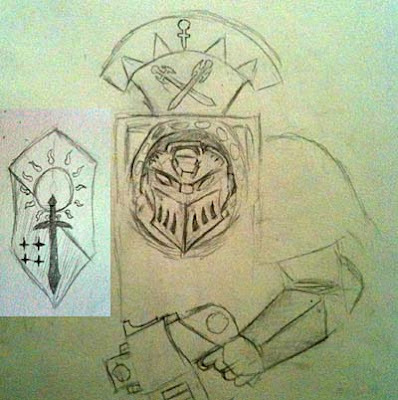 This picture was taken before I sculpted the chapter symbol onto it. At first, I wasn't sure if I could fit them on there at this scale but ended up being able to do it. 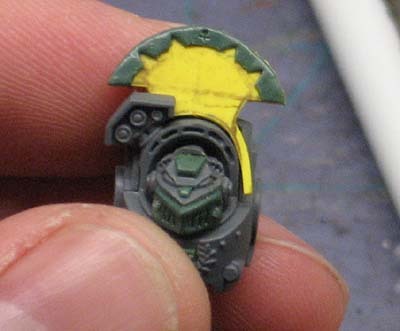 You can see the conversion work done to the helmet as well. 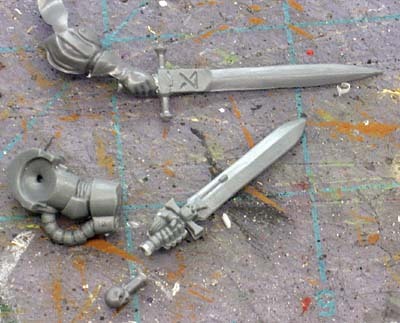 It's the "Grey Knight" conversion with an extra face plate bolted on. I added a small tab at the top to bulk it out visually. And my single most favorite part of the whole project. The conversion work I did to the crux. I cut away the bones and replaced them with crossed swords. How perfect is that? You can't beat that for tying the chapter icon into the model. And then I realiZed I'd done it all to a regular crux and not a Sergeant one so I had to sculpt the lower portion and add a gem to it. And a quick mock up of his pose. 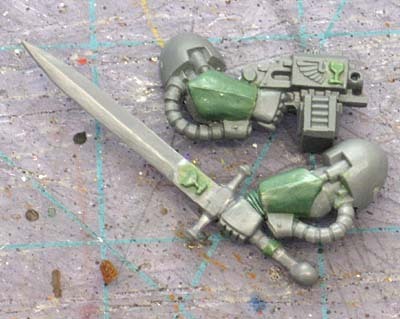 Sword pointed, gun at rest, foot up on object, all the essential elements for a nice Commander model. He was a blast to paint as well. The last picture doesn't show the half tabard added to him or give you a good look at the chalice sculpted on his right shoulder. You'll get to see all that when I post the finished pics of him. Looks great mate! You sculpt really well! How do you achieve such a smooth finish to your green stuff work? I've tried gloves, water, but still cant get that smooth finnish! It takes time, but you move fast after a while of doing it since it becomes habit. That's a pretty awesome mod, I do have to say. I'm a little surprised that with all the custom work you do, you don't make molds. I think I'd have to if I sculpted lots of mods. The problem I always have with working with tiny amounts of greenstuff (like the chalice icons) is keeping the GS stuck to the figure, and not sliding off when I try and work with it. Dave G_Nplusplus: I've thought about it, but most of it is custom work and specific to one model. It's a space, time, resource thing. I know making molds and casts (and doing it right) can be time consuming and I just don't have the time to invest in it right now. Rob: When you're putting the GS on the model, try not to get any water between it and the model. Like you would when gluing something... you try not to get glue anywhere other than right between the two joints, the opposite goes for GS. Try not to get water between the the joints. Outstanding work. I love the face guard and the forearms! It's simply amazing what you can do with these kits and a bit of imagination. 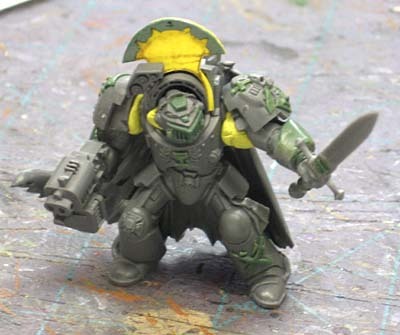 Is the Grey Knight helmet conversion you are referring to this image? Michael: Yes, that's it, thanks for the link. I'd seen it way back, but did not know where it came from.